Let's start off with skinning. Mostly this will just be a case of explaining where the relevant files can be found and how to make the pk3. There are various skinning tutorials on JKHub which go into more detail for specific aspects of skinning. The skin I'll make in this tutorial will be a jedi with a shadowtrooper force crystal. 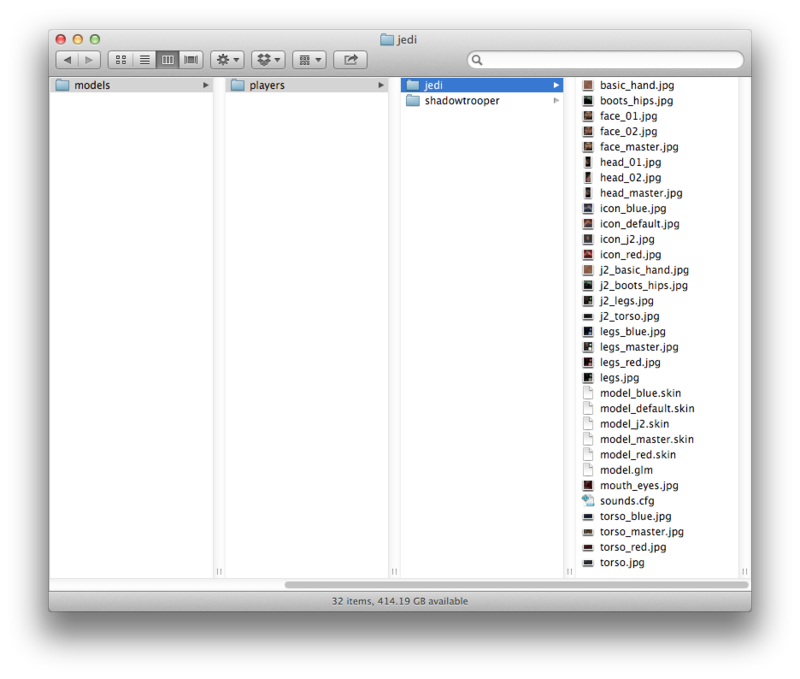 Firstly, create a folder called models somewhere. Create a folder called players inside it. You'll have to extract the whole of the assets files, which will take a little longer. 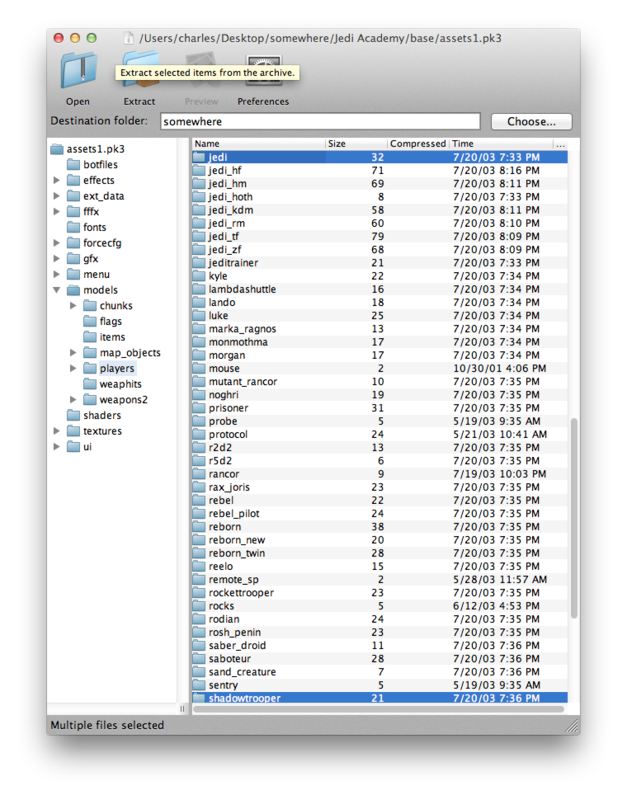 Find your assets1.pk3 file in your base folder. All of the models and skins in the game are contained in this file. 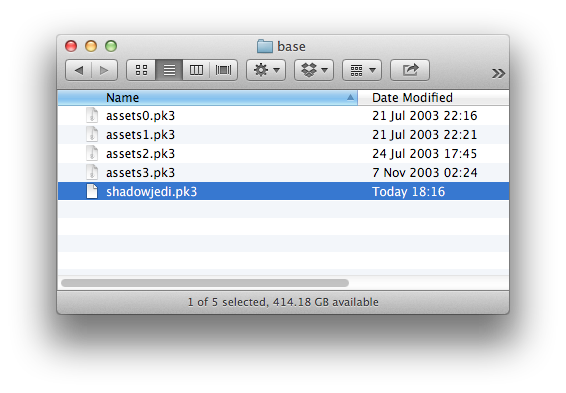 If you have an unarchiver other than the default one, you can probably just extract assets1.pk3 straight away. Unfortunately, to use built-in unarchiver you should (temporarily!) rename assets1.pk3 to something like assets1.zip. Extract it, then rename it back if necessary. Navigate to models/players/ inside the extracted folder. This is where all of the skins and player models can be found. Find the jedi and shadowtrooper folders, and copy them into the players folder you created earlier. This is much easier! Open assets1.pk3 up in your archive browser of choice. Navigate to models/players/. This is where all of the skins and player models can be found. Find the jedi and shadowtrooper folders. With some archive browsers you can just extract these straight to a players folder as above. 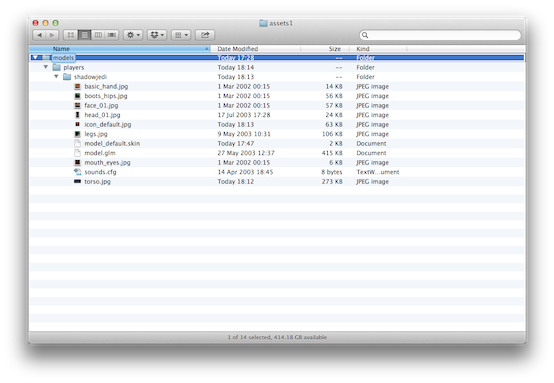 With Zipeg, select the two folders, make sure you have the destination folder set up properly, and hit extract. 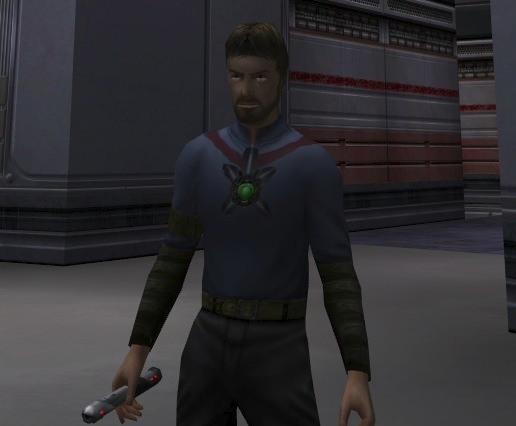 Firstly, let's rename the jedi folder to shadowjedi. Open up the shadowjedi folder. 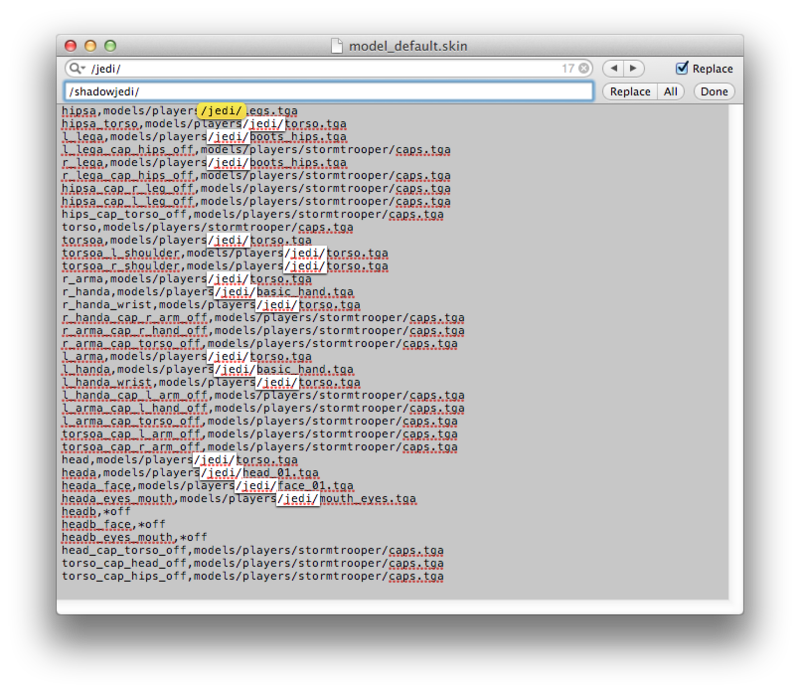 Open up the model_default.skin file in the shadowjedi folder in TextEdit or your favourite text editor. This tells the game which images or shaders to apply to the model (and where). In your text editor do Find and Replace… to replace all occurrences /jedi/ by /shadowjedi/ so that the skin is pointing at the right images. Save model_default.skin. Currently our shadowjedi skin isn't any more like a shadowtrooper than the regular jedi skin. Time to do something about it! 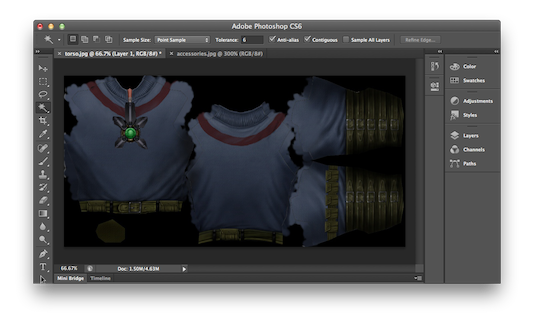 Open up torso.jpg in the shadowjedi folder in your favourite image editor. Also open accessories.jpg from the shadowtrooper folder. torso.jpg is the image that is applied to the arms and torso of the model. Save torso.jpg with your changes. If you want, you can also edit the icon_default.jpg file. Feel free to delete the shadowtrooper folder too now, you won't need it anymore. Now, control- or right- click on the models folder. Hit Compress "models", and it will make a file called models.zip. Rename that to shadowjedi.pk3, making sure that there isn't still a hidden .zip extension. You could also use an alternative archiver if you have one for this. Put it in your base folder, and start up multiplayer. Your icon should show up in the list. There! Now you've made a skin. This article is my 7th oldest. It is 673 words long, and it’s got 0 comments for now.